Medium voltage power distribution is option of electricity delivery that is on the rise. It an a more economical and responsible method of carrying electricity from the main transmission system to the end user. During the pre-construction planning stage, our electricians will work with you to determine if medium voltage utility with be a good option for your needs. Medium voltage utilities carry electricity from the main transmission system to the end user, through a network of power lines, substations, and transformers containing less than 50kV of power. This direct method of delivery can be more cost effective and eliminate wasted electricity and system components for residential, commercial, industrial, public works, and a variety of specialty industries. During the pre-construction phase, our electricians will work with you to determine if medium voltage utilities is a good option for your needs. The ability to see the entire project scope will allow us to design or modify your medium voltage system. How do I know if medium voltage utilities is a good fit for my project? Our electricians can examine how this could benefit you during the design phase, then recommend the best fit of products and systems for your project. What are medium voltage utilities? 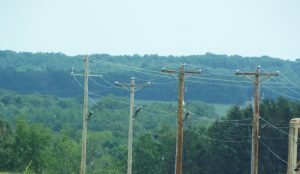 Medium voltage utilities carry electricity from the main transmission system to the end user, through a network of power lines, substations, and transformers containing less than 50kV of power. What types of industries or projects can take advantage of medium voltage utilities? This direct method of delivery can be more cost effective and eliminate wasted electricity and system components for residential, commercial, industrial, public works, and a variety of specialty industries. Where are medium voltage utilities and how are they categorized?